It's going to be a very hectic week for me this week . Need to submit my thesis draft, some assignment that I didn't start a thang (been given weeks ago kahkah), some more I need to submit client's article and blog post according to the dateline and blablabla (a lot for me to list down all of em) not including to spare some time for me to manage my business . I start my day every day at 6am . Perform fajr prayer , recite Qur'an , doing some light exercise and getting myself ready for class or any event I need to attend on that day . My class normally start at 8.30pm and I spend 30 mins driving to reach my college from home . Therefore, I need to carefully arrange and manage my time wisely so that I got a chance to have my breakfast . Even if I'm in a rush, I always make sure that I bring along a bottle of water and some plain crackers or sandwich for my on the go meal . For me, breakfast is very very very important to kick start our day . And that's what MILO are trying to highlight by organizing the 'Malaysia Breakfast Day' . Malaysia Breakfast Day is an event with an objective to educate people about the importance of breakfast . Did you know that those who didn't have breakfast tend to lose up 80% of energy? That's a lot! A study was done to 8000 respondents amongst student in primary and secondary schools in Malaysia showing results that students who eat breakfast are more energetic throughout the day compared to those who didn't. The study also shows that kids who are having MILO for their breakfast have higher numbers of calcium and vitamins in their body compared to those who didn't. By having breakfast to start our day, it's not only giving us energy but also good in keeping us focus and active helping us to complete our daily tasks in the most efficient way. 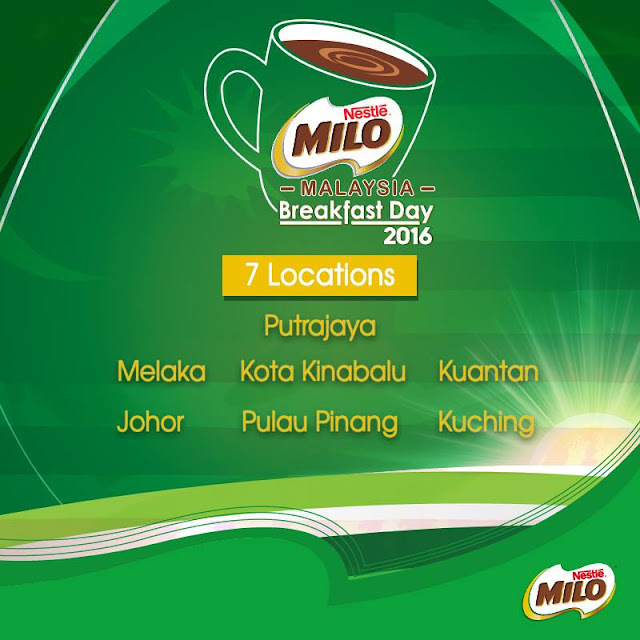 So come and join the fun with MILO for Malaysia Breakfast Day! There's a lots of activities prepared for you guys - including Zumba session, games, lucky draw and some selfie contests. Don't forget the FREE BREAKFAST and FREE MILO drinks too! Check out www.milo.com.my for more info. Melaka just had their breakfast with MILO and next, they're coming to Taman Gelora, Kuantan Pahang on April 10th, 2016. Don't missed the chance to join this and always remember to never skip your breakfast, okay? 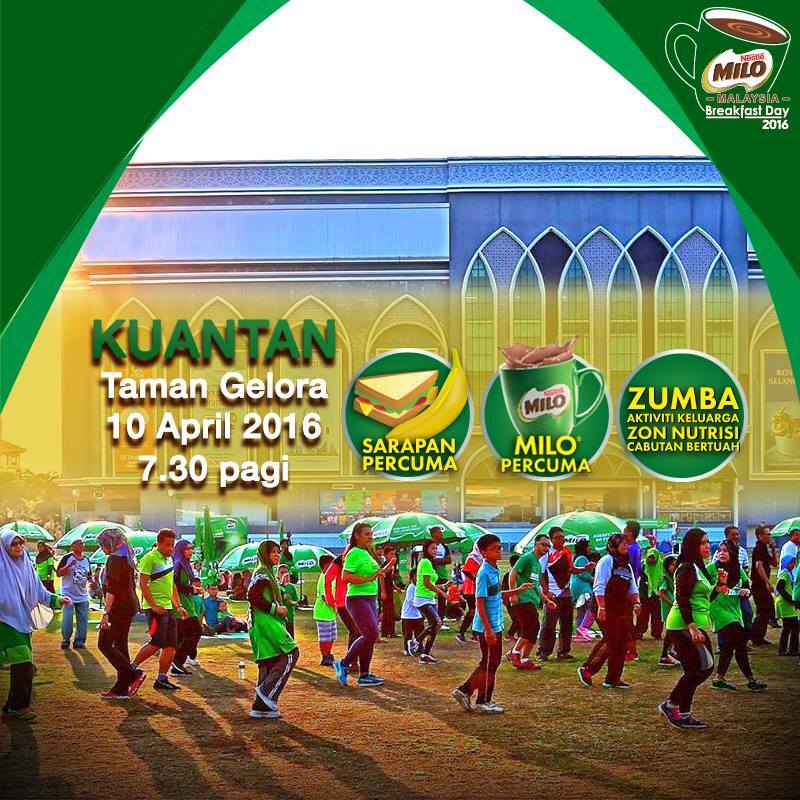 Minum MILO anda jadi sihat dan kuat.. yeahhh! kitaorang breakfast arini memang ngan MILO pun.. yum yum!